It’s been over two decades since Alanis Morissette’s Jagged Little Pill hit record store shelves and I remember it well. I also remember seeing her live at Sunrise Musical Theatre in South Florida and sitting behind Steven Tyler who was dressed in a full leopard print outfit. 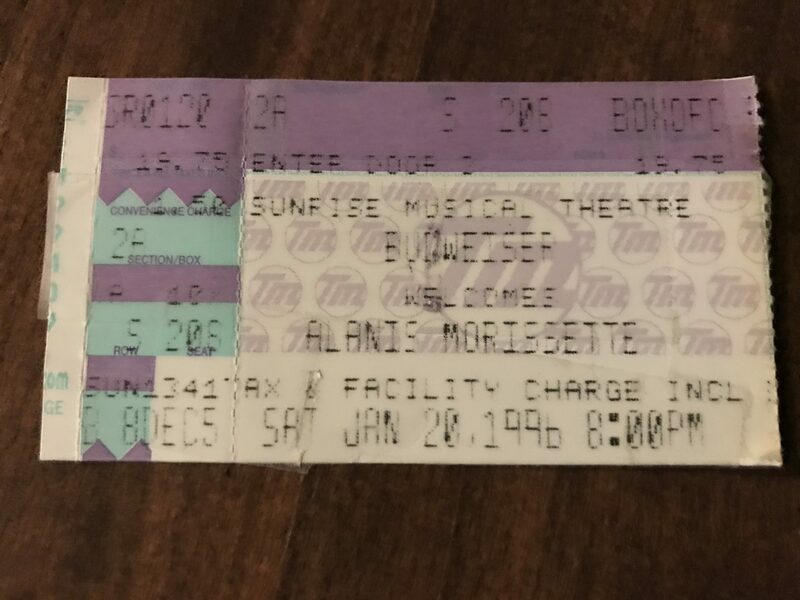 According to my ticket stub, that show took place on January 20, 1996. Today is January 28, 2019. Time flies. I listened to that CD so many times I can’t believe I didn’t destroy it. I had never heard a voice like that, singing about stuff that mattered, and playing harmonica like her life depended on it. Morissette’s debut was nominated for nine Grammy Awards and won five, including Album of the Year, and is still one of top-selling records in history. It sold over thirty-three million copies worldwide. And now there’s more. Jagged Little Pill is headed to Broadway this fall. The musical is slated to intertwine Morrissette’s songs, along with some new material, with a book by Oscar winner Diablo Cody (best known for Juno), that tells the story of a multi-generation, multiracial suburban family dealing with a variety of issues including addiction, race, sexual assault, and gender identity. Whew that’s a lot going on in one plot but either way I’m excited! Jagged Little Pill defined a generation and I love that it still matters to so many people. And of course, everyone in the English-speaking world knows all the scathing words to “You Oughta Know.” As they should. Jagged Little Pill began performances in May 2018 at the American Repertory Theater in Cambridge, Massachusetts, selling out all 79 shows. From what I’ve read, the show received so much praise from critics, including The New York Times, that it earned a spot on Broadway.